Over the weekend the Watches of Knightsbridge auction took place and for the first time it was held in Dubai, Saudi Arabia. There were a fewer amount of lots than typically available but there still were some great pieces that ended up finding new homes. To see the full selection of auction results or to find out more about the upcoming March auction, head over to www.watchesofknightsbridge.com . To see the results in the gallery below, simply hover your mouse over the picture. Unsold. 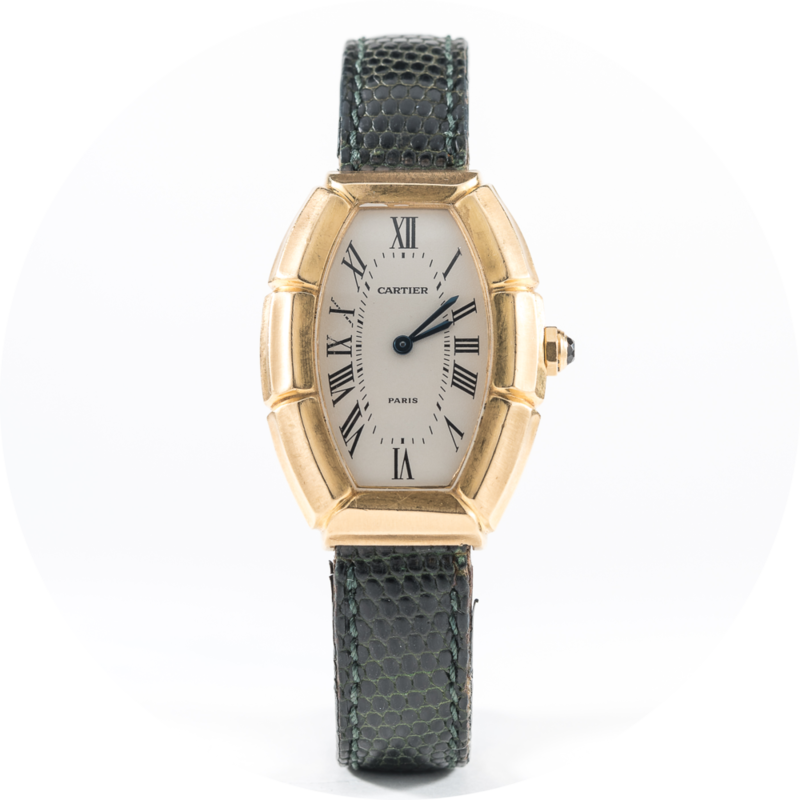 When considering the environment in which the auction was held in might not be too much of a surprise as this is a more modern Cartier quartz rather than an older mechanical piece. I still think it's an interesting watch despite the quartz movement because of the bamboo shaped yellow gold case, a shape usually associated with Gucci. Unsold. This was a big surprise to me. I would have expected this piece, limited to only eight pieces, with such an interesting dial would have found a buyer immediately but it wasn't to be. Perhaps the Jaquet Droz brand does not carry that much weight in Saudi Arabia compared to more established and recognisable names. If those present had read my article on meteroite dials I'm sure they would have understood just how special this piece was. SOLD: 900 GBP. I'm glad this Omega found a home as it marks one of the key moments in horological history with it's amazingly accurate quartz movement. It could never be described as being conventionally attractive but I think it's gorgeous and I'm glad someone walked out with it. With Omega now pushing forward with the METAS certification for their Master Chronometer pieces, this Marine Chronometer serves as a reminder to what came before them. SOLD: 3000 GBP. Unsurprisingly, the vast majority of the personalized Rolex Datejusts in this auction did not come back to London with Watches of Knightsbridge and this is watch was one of them. Selling towards the lower end of the estimate, I find this Datejust charming in it's simplicity of personalization and I can't believe I'd ever like a green aligator strap so much. SOLD: 34,000 GBP. Yeah. Did you really expect this one to go unsold? For me, and probably those in attendance, this was the star of the show. Surprising absolutely no-one, this beautiful example of the first GMT Master reference sold for four thousand pounds over it's auction estimate. With such a great case, bright colorful bezel and lush gilt dial, (even after all the years of faithful service) meant that this watch was finding a home one way or another. I've learnt that when it comes to auctions there is no such thing as a sure thing, But this was a sure thing. If you would like to receive weekly updates for all articles published to Timepiece Chronicle then sign up to the newsletter!